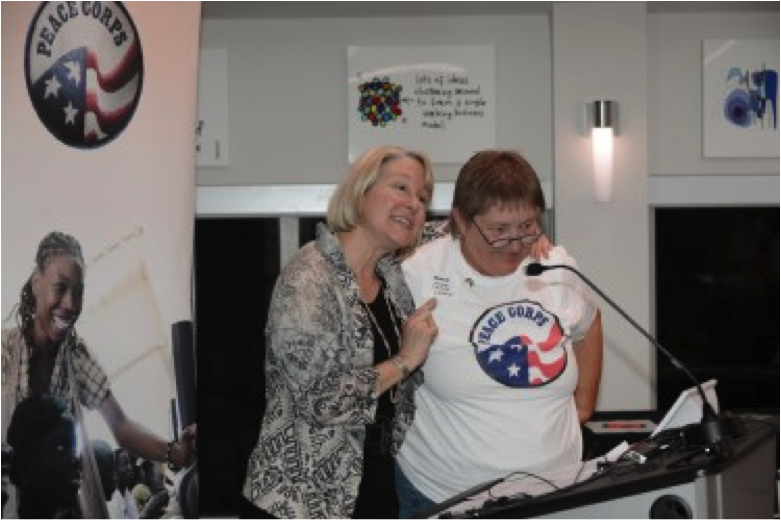 Over 140 fans of the Peace Corps, including more than 50 RPCVs, attended the February 25th PC week event at UM to join UM President Donna Shalala and Acting Peace Corps Director Carrie Hessler-Radelet. The evening started with on-line video conversations with three PCVs serving overseas. Carrie Hessler-Radelet talked about her experience meeting the President of Sierra Leone, who talked of a PCV named Sharon whom he knew when he was eleven, and Hessler-Radelet was thrilled to again meet Sharon Alvarado of Key Largo (Sierra Leone 1964-66) who was in the audience. RPCV Linda Lubin gave an impromptu and moving talk about her experience as a PCV in Mombasa, Kenya (2004-2006), in response to a question from a student interested in joining the Peace Corps. RPCVSF's Founding Director and Legal Counsel Greg Zell (Nigeria 1962-1964) was honored and recognized as the first living graduate of UM to have served in the Peace Corps. RPCVSF presented a certificate to President Shalala in recognition of her becoming our first Lifetime Member of RPCVSF, click here to read the certificate: Pres. Shalala. And we presented a letter from our friends at the Madison, WI RPCV group, honoring President Shalala for her contributions when she was Chancellor at the University of Wisconsin - Madison. Live from Madagascar, the Philippines and Namibia, UM grads now serving in the Peace Corps joined UM President Donna E. Shalala and Peace Corps Acting Director Carrie Hessler-Radelet for a first-of-its-kind video chat on the toughest job they’ll ever love. CORAL GABLES, Fla. (February 20, 2014) undefined Both women joined the fledgling Peace Corps in the 1960s, just two years apart, one serving in Iran, the other in Sierra Leone. Over the next half century, the first would shatter glass ceilings, and serve a U.S. president. The second would work more anonymously as a science teacher, never knowing her example inspired an 11-year-old boy who, five decades later, would become the west African republic’s fourth president. On Tuesday evening, UM President Donna E. Shalala, one of the Peace Corps’ most visible returned volunteers and prolific recruiters, and Sharon Alvarado, one of the self-described “little people” who over the Peace Corps’ 53 years have shown the true faces of America to the world, gathered at the Toppel Career Center for a special information session for UM students and others who already have signed up for or are contemplating joining the Peace Corps. With three UM graduates and current volunteers answering questions from their overseas posts via a live video chatundefineda first for the annual information sessionundefinedproducing valuable insights into the hardships and rewards of what Peace Corps Acting Director Carrie Hessler-Radelet said was the hardest, most stressful job she’s ever loved. When President Shalala, whose father tried to bribe her with a Mustang to ignore President Kennedy’s call to service in 1962, asked the current volunteers what they had learned about themselves, each conveyed the same familiarity with intense joy and deep despair. Speaking from Madagascar, UM graduate Rory Lincoln says he loves his experience so much he’s extended his Peace Corps duty another year. “The ability to endure. It’s really, really difficult sometimes,” answered Rory Lincoln, a 2010 broadcast journalism grad who is teaching English in Madagascar, where he helped establish a library. Yet Lincoln is so enamored with his experience, he told the audience he had just extended his service for a third year. “I can handle a lot more than I thought,” echoed Andre Heard, a 2011 international relations graduate from his tiny village in Namibia, where he brought the first source of clean and convenient drinking water. Listening from the audience, Jasmine Rosa, who is heading to Macedonia for the Peace Corps as part of her capstone project for her Master’s in Science Education, was not dissuaded by the frank talkundefinednot even when other volunteers confirmed that, as a Puerto Rican Chinese-American, her new community would likely question her authenticity as an American. As she noted, promoting a better understanding of America is a Peace Corps mission. Aside from Shalala’s own recollections of how the Peace Corps made her “a citizen of the world,” the highlight of the evening was Alvarado’s remarkable tale, which Hessler-Radelet began to tell as an example of the impact Peace Corps volunteers leave, often without knowing it. Unaware that Alvarado, who lives in Key Largo, was in the room, Hessler-Radelet recounted how Sierra Leone President Ernest Bai Koroma told her that a Peace Corps volunteer in his village of Makeni had changed his life by teaching him the importance of serving a cause larger than himself. But all he knew was her first name: Sharon. Thinking it’d never happen, Hessler-Radelet offered to try to reunite Bai Koroma with the volunteer if he ever came to the U.S. A week later, he called to say he was on his way. 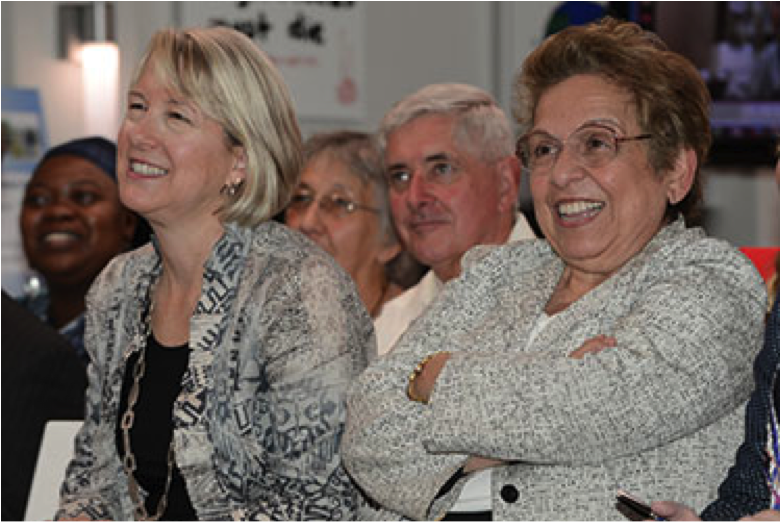 Peace Corps Acting Directer Carrie Hessler-Radelet and UM President Donna E. Shalala enjoy hearing how overseas service is transforming UM graduates. A mad scramble through Peace Corps records for all the Sharons who served in Sierra Leone during the mid-1960s ensued, eventually leading to Alvarado. But the retired science teacher who now dabbles in art would end up telling the president the same thing she told the audience Tuesday night: She didn’t remember him. She did, though, live during her service years in a house owned by Bai Koroma’s mother, and he was among the scores of boys who congregated outside, learning from her example. For Shalala’s own consistency as one of the Peace Corps most visible and ardent supporters, Hessler-Radelet honored UM’s president and the nation’s longest-serving secretary of health and human services for her 50 years of dedication to the Peace Corps. And for Alvarado’s quieter contributions, she gave her a warm hug. Maya Bell can be reached at 305-284-7972.